This was a close race all the way, but Edgar Wright’s hilarious 2004 comedy gets the hard-fought victory. Two bona fide George Romero classics finished second and third, and the relatively recent Zombieland put in a good showing as well. Might have to fire up Shaun of the Dead this week.. it has been too long! This Week’s Poll: Monster’s University was tops at the box office once again this weekend. While I have yet to see the film, I do have a weakness for college movies in general. This week’s question is, what is your favorite college movie? Do you still think nothing can top Animal House? Are you a Will Ferrell junkie that swears by Old School? Or is there something else that you enjoy more? A close and heated race, but I’m not surprised at its outcome. Though I am very pleased to see George Romero’s original, ‘Night of the Living Dead’ and ‘Dawn of the Dead’ place so strongly! As for college films. I have to go with ‘Animal House’ and ‘The Paper Chase’. Romero certainly had a good showing in the poll — his films accounted for nearly half the votes. Speaking of which, it’s high time that I finally sit down for all of Dawn of the Dead. Have only caught clips of it over the years, unfortunately. Haha, I know what you mean. I was surprised to find so many fun films when putting it together. Which ones did you pick? I was debating between Animal House and Old School, which came out while I was in college and was a big hit with buddies and I. So, I went with the more personal choice, old school. I always get a kick out of Old School as well. Been ages since I saw it… might have to give it another watch soon. I chose the two comedies for the college movie poll (Animal House and Back To School). A couple of classics — nice! Have only watched 2-3 of those college films listed. I’m going with Good Will Hunting & Social Network. Good Will Hunting is one I still need to see, unfortunately. Love The Social Network though. Like Chris, I’ve only seen 3 of these films and like Chris, voted for Good Will Hunting and Social Network. Wow, I need to see more of these films me thinks. There are a few I still need to see as well — Good Will Hunting being one of them. Oh yeah, I’m a big fan of Zombieland as well. Haven’t seen it since the theater though, so I’m due for another watch. But you’re absolutely right — Bill Murray’s cameo is brilliantly executed. That whole movie is a riot. And you can’t go wrong with Animal House. Really surprised that one isn’t winning, actually. 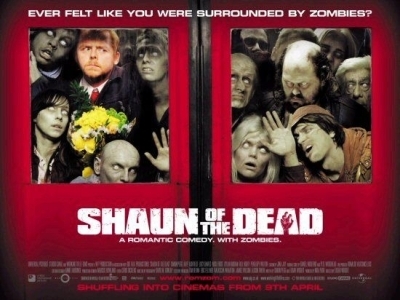 Sorry I missed this poll but I’d have to go w/ SHAUN OF THE DEAD also because it’s hilarious! But then again I don’t watch a lot of zombie movies, ahah. Shaun of the Dead has universal appeal, no doubt. Great movie! Fantastic result for your poll on Zombie movies! Shawn of the Dead is a brilliant film, its so funny, its one of my favourite films. I love it, too. Can’t wait for the next Wright/Pegg/Frost film — The World’s End! Yes, that will be brilliant. Really looking forward to The World’s End as well.